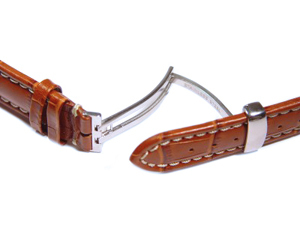 Here you will find a description on how our foldover clasp works and the instructions to fit it to your watch strap. 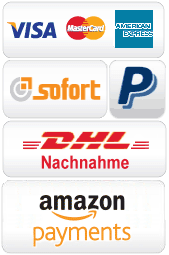 The single buckles are available in our section Watch strap clasps and buckles, and complete watch bands can be found here Foldover watch straps. 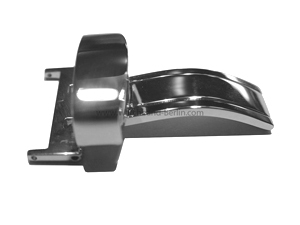 Our foldover clasps are made of stainless steel and have a joint (hinge). They are not suitable for metal watch straps. They are fastened to the watch band by spring bars. Through the pin underneath the clasp it is possible to adjust the strap length. The pin is located on a flap which can be opened to pull the watch band through. This clasp folds and locks thanks to a pressure tab. In order to open the clasp, you have to apply a slight to moderate pressure at the end of the strap until the clicking mechanism is released. Our foldover clasps are well-tried and we have had them for years in stock. For this fastening, the maximum possible strap thickness at the clasp is 3 mm. Watch bands whose perforated sides are thicker than 3 mm, therefore, are not compatible. The available widths are: 12mm, 14mm, 16mm, 18mm, 20mm and 22mm. 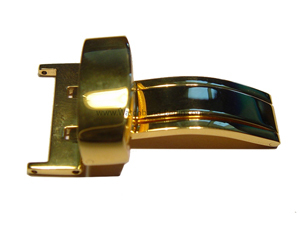 We quote foldover clasps in the following colours: steel and gold (gilded). Both can be purchased separately (without a watch band) as well. If your original closure is not fastened to the strap with a spring bar, it is unfortunately not possible to replace it with a foldover clasp. Before removing your old fastening(for example a buckle with post), it is necessary to determine how it is fastened to the strap. 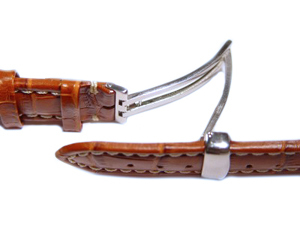 Buckles and clasps are mostly held in place by spring bars, which must be pressed by sliding a pocket knife or a spring bar tool between the strap and the fastening. 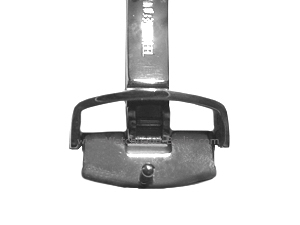 Once the buckle is detached, the spring bar must be pulled out and now you can remove the post and slide the spring bar back into its original position. The notch at the end of the strap, where the buckle's post used to be, will be hidden by the new clasp when it is closed. The new clasp can now be attached. Generally, no special tool is needed. First of all, you must place the clasp at one end of the spring bar and then you must apply pressure on the other end until the spring bar fits into the foldover clasp. Finally, the spring bar must slide into the pinhole on the clasp. Congratulations, your new clasp is now attached! In order to adjust the length of your watch strap, you must fold down the flap with the pin first. The flap has a joint on one side which works as an axis and is visible when looking at the clasp sideways. By folding it down, an opening is created through which the strap can be pulled until the desired length is reached. At this point the strap must be secured by pulling the pin up. The length must be adjusted only once. 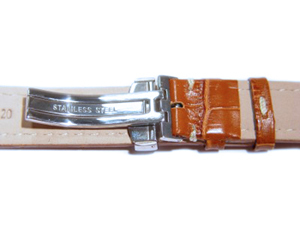 When the clasp is fitted and open, the strap is wide enough for the wrist to pass through it.